If you’ve got a 4-year-old who’ll be testing for the first time this school year, you may have no idea what to expect. Luckily, we’ve got expert insights on how testing works for Pre-K students from TestingMom.com co-founder/NYC gifted testing expert, Michael McCurdy, and Dr. Kim Har, psychologist and former director of childhood education at Aristotle Circle. Here they provide the BEST test prep tips for four year olds. Will my daughter take the exam with one or more examiners or will it be administered one-on-one? She is in public school. Michael’s advice: Testing in Pre-K tends to be done in a one-on-one setting, but testing in Kindergarten is less consistent. Your daughter may take the test one-on-one or in a group with three or four other children, depending on how big her class is at her current school. 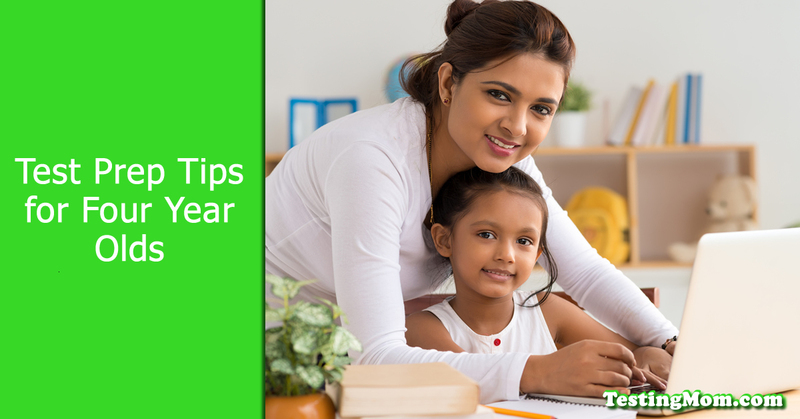 You should check with your daughter’s school first to get information regarding the test administration process, just to be sure. How do you build up a 4-year-old’s stamina for sitting up to an hour or more during a test? Dr. Har’s advice: Much like any other skill, the ability to focus and remain attentive for extended periods of time is something that can be improved with practice. Start by finding out what your child’s current “threshold” is by working on practicing together and seeing how long you both can go before your child starts to get distracted or bored. Then, depending on how frequently you work together, try to increase the duration over time. For instance, if your child is already working for 20 minutes with no problem, increase it to 30 minutes the next week, 40 minutes the next, and so on. Most importantly, always provide positive reinforcement and encouragement whenever your child is working hard and staying on-task. Remember: Kids don’t know that they’re doing a good job unless you tell them they are! If you’re looking for ways to effectively prep your 4-year-old for testing, I highly recommend our Kindergarten Readiness Program (it’s included when you sign up for any TestingMom.com membership).